The number one challenge with today's young talent is a problem hiding in plain sight: the ever-widening soft skills gap. Today's new, young workforce has so much to offer—new technical skills, new ideas, new perspective, new energy. Yet too many of them are held back because of their weak soft skills. Soft skills may be harder to define and measure than hard skills, but they are just as critical. People get hired because of their hard skills but get fired because of their soft skills. Setting a good example or simply telling young workers they need to improve isn't enough, nor is scolding them or pointing out their failings in an annual review. However you can teach the missing basics to today's young talent. 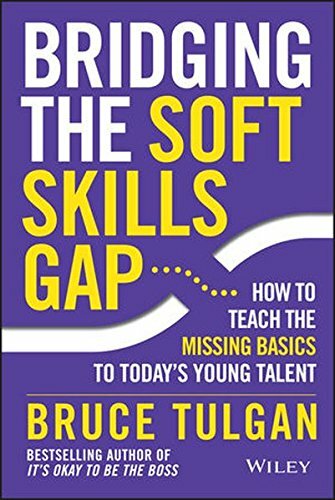 Based on more than twenty years of research, Bruce Tulgan, renowned expert on the millennial workforce, offers concrete solutions to help managers teach the missing basics of professionalism, critical thinking, and followership—complete with ninety-two step-by-step lesson plans designed to be highly flexible and easy to use. Tulgan's research and proven approach has show that the key to teaching young people the missing soft skills lies in breaking down critical soft skills into their component parts, concentrating on one small component at a time, with the help of a teaching-style manager. Almost all of the exercises can be done in less than an hour within a team meeting or an extended one-on-one. The exercises are easily modified and customized and can be used as take-home exercises for any individual or group, to guide one-on-one discussions with direct-reports and in the classroom as written exercises or group discussions. Managers—and their young employees—will find themselves returning to their favorite exercises over and over again. One exercise at a time, managers will build up the most important soft skills of their new, young talent. These critical soft skills can make the difference between mediocre and good, between good and great, between great and one of a kind.